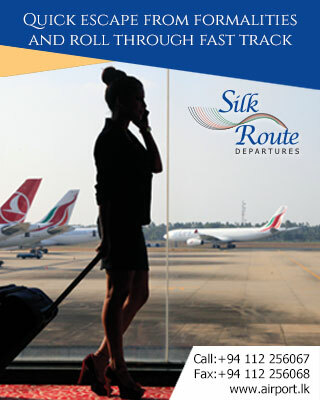 Silk Route Lounge Terms & Conditions. The online billing site is specially designed for Online Booking users of CIP Longue. These pages could be used as an easy but yet efficient way to book the CIP Facility in advance. The International Master or Visa card information will not be collected by Airport & Aviation. Airport & Aviation or any other third party will not have access to your credit card information at any time. In the event of any Internet CIP Lounge booking related issues you can directly send mail to cipbooking@airport.lk with your subject or you could call us on+94-11-2252861. Any payment made will not be less than 1 US $ and not more the 1000 US $ per transaction. All payment made within this Web site (excluding International credit cards) will be processed with in a periods of 24 hours. All non Sri Lankan issues Credit cards (International Cards) used to make payments within this Web site will have maximum processing time of 4 to 7 days. This is due to offline verification process which will be undertaken in order to prevent fraudulent transactions. All customer information collected over the web will be confidentially protected by the company subject to normal law of the country. All legal liability and prosecution will be in order UNDER THIS ACT CITED AS THE PAYMENT DEVICES FRAUDS ACT, NO. 30 OF 2006. This Act will look at the following offences and will be punishable by laws of the Land.